Ah, Disney-Pixar. Never again shall I doubt the partnership of the house of mouse and jumping desklamp as arbiters of the movie sequel. 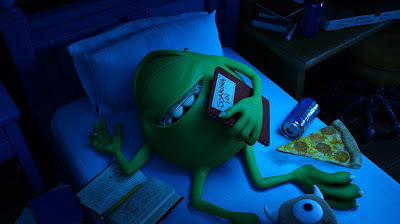 My initial trepidation at the very concept and essence of Monsters University combined with a general nonchalance for prequels as a whole meant I was more than prepared for this latest offering to be a passable but altogether unremarkable affair that would surely pale in comparison to its brilliant, charming and imaginative predecessor. In fairness, these concerns were not altogether unfounded - Pixar's output of late has been a little hit and miss to say the least (Brave, anyone?) and their most recent sequel took an already below-standard franchise and elevated it to new levels of stagnancy with Cars 2 just two short years ago. And yet thankfully Monsters University washes away any bitter aftertaste of oil, grime or haggis (forgive the Celtic stereotyping) and presents a vibrant, gleeful and irrepressibly charismatic romp that is every bit as enjoyable, hilarious and entertaining as Monsters Inc. before it. Set before the events of Monsters Inc., University centres once again around that films protagonists, monsters Mike Wazowski (the ever-reliable Billy Crystal) and James P. ‘Sulley’ Sullivan (John Goodman), depicting their first meeting at the monster equivalent of college/university and the eventual blossoming of the friendship that sets them up for where we find them in the first film. Unsurprisingly, we see that getting there was no plain sailing, and the initially hostile odd-couple-who-become-unlikely friends may be a little old hat and tried-and-tested, but when given an injection of Pixar warmth and wit and Disney gloss and shine it’s difficult to not find it as original and refreshing a concept as ever, particularly in such an imaginative and endearing universe and boasting two such irrepressible lead performances. Channelling its inspiration and derivation from a wealth of buddy/college movies and tropes into what Pixar do best - character-driven comedy with just the necessary amount of depth and development - the very nature of the movie director Dan Scanlon and his team set out to make allows them to crucially have a great deal of fun and not merely set out to re-hash the original. 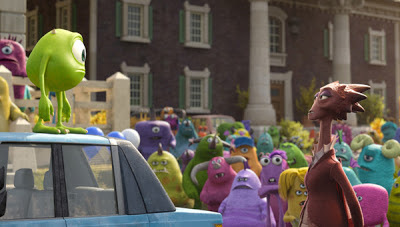 As was the genius with the Toy Story sequels, with each establishing their own purpose and finding their own reasoning to exist as character-centric pieces of both entertainment and storytelling, Monsters University never feels perfunctory or shoehorned in as so many sequels, prequels or spin-offs fall prey to. 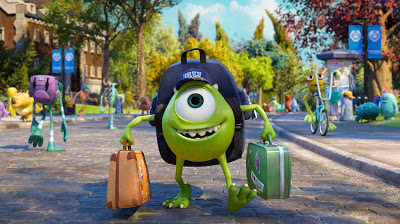 In the case of University, Billy Crystal’s Mike takes front and centre, heading up a story which is suitably Disney-esque in it’s reaching for dreams and ambitions despite being an unlikely hero or social outcast, and it is true that many of the narrative brushstrokes found here are familiar and somewhat derivative. 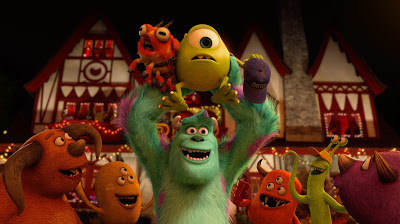 However, rarely have they been painted with such fun and finesse, and in this bizarre, heightened fantasy word of monsters and mayhem, as with the original movie, Scanlon and team do a terrific job of unearthing the inherent humanity and empathy of their characters, and the ambitions and goals of Mike and Sulley are just as easy to root for and invest in here as they were in the Monsters Inc.
With both Mike and Sulley initially at odds and disdainful of one another in suitably satisfying ‘jock versus nerd’ fashion, the duo eventually find themselves having to pair up and join forces with a group of other misfit monster students, the brilliantly socially-awkward fraternity ‘Oozma Kappa’ in an attempt to win a series of university games and challenges that they are required to succeed in so that they can fulfill their dream of becoming official ‘scarers’ and reclaim a spot on the prestigious scaring class. The journey the film depicts is peppered with more than a liberal dosing of cliche and convention, championing effort and hard work over raw talent and complacency, the importance of solidarity and group work over selfishness and single-mindedness, and as touched upon the value of looking beyond the surface and not underestimating ‘the little guy’ or the unlikely candidates. 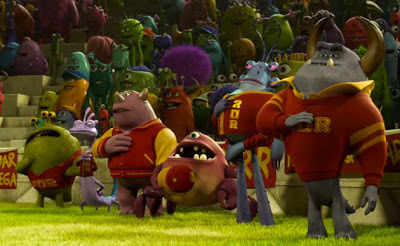 And yet for all of its familiar framework, Monsters University is continually and inexhaustibly creative in both its comedy and storytelling, and the sheer imagination, originality and invention on display throughout make it one of the studios most vibrant and energetic outings, which says something in and of itself. 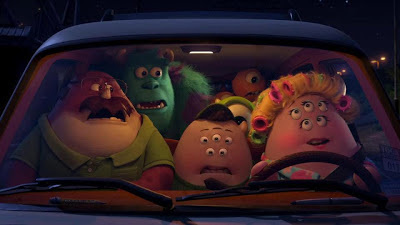 This is perpetuated by a much lighter tone than even Monsters Inc, with the absence of the character of Boo and any similar storyline meaning that in some ways University does perhaps sacrifice a little of the originals heart and sentiment in favour of a slightly more boyish and boisterous vibe. Sulley is not the instantly-lovable figure he was, Mike has no love interest, the closest the film has to a villain is a much more principled (literally), passive-aggressive figure than the overt nasties of the original, and much of the ‘cute’ factor has been removed as befits the story being told. Again, anyone expecting a re-hash of Inc, even tonally, will be left disappointed, though to do so would be overlooking the consciously and admirably different movie University sets out to be, and wholly succeeds in becoming. That’s not to imply that Monsters University is by any means perfect or without it’s flaws. The original films’ villain Randall Boggs (Steve Buscemi) returns here though in truth his arc in the film is awkward and a little forced to say the least - going from clumsy, goofy roommate to essentially the treacherous turncoat from the first film very quickly and with minimal development, and it’s a slice of the backstory that ultimately feels cheaper and more forced than the character work around it. 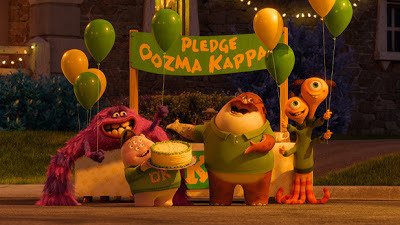 It says something when the majority of new characters, in particular the wonderful Oozma Kappa troupe, continually outshine and feel more organic to the story than a major returning character. The same can almost be said of Sulley too, who feels a little sidelined for some of the film as Mike steps forward and relegates him to a more supporting position than he had in Inc. Mike worked perfectly in a slightly less central role in Monsters Inc. due to his brash, comedic nature, whereas here Sulley is not quite so well suited to the slight shift in focus that University presents, though fortunately the latter half of the film does flesh him out and let the burgeoning friendship even out somewhat. However, in doing so the film does fumble a little around the third reel, losing some of its impetus and seemingly not altogether quite sure how it wants to resolve itself, leaving a slightly messy and inconsistent jumble of semi-endings and set pieces that eventually trip their way into a resolution that, whilst admirable in not being overly predictable or formulaic, still ends up feeling a little more rudimentary and by-the-numbers than the more enthused and jovial first two-thirds of the film, where the set pieces in particular are wonderfully purposeful and genius in their execution - from a hilarious booby-trapped race to an encounter with what is probably cinemas most ill-tempered librarian ever. Thankfully, none of these minor shortcomings are dealbreakers, and there is plenty more of what Monsters University gets undeniably right. As is standard for Disney-Pixar, the voice cast do a stellar job, and the marrying of voice talent and animators again strikes gold. Billy Crystal and John Goodman are the lynchpins of the cast, putting in heartfelt, genuine performances whilst unsurprisingly knocking the comedy out of the park. Crystal’s natural penchant for comedic frenzy in particular is again to put to brilliant use as Mike, a whirlwind of exuberant hilarity, though for all of the laughs and more outrageous moments he crucially hits all the emotional highs and lows just as faultlessly. Helen Mirren puts in a commanding, suitably ambiguous turn as the universities intimidating and rigorous Dean Hardscrabble and Joel Murray is one of the Oozma Kappa standouts as mature student Don. 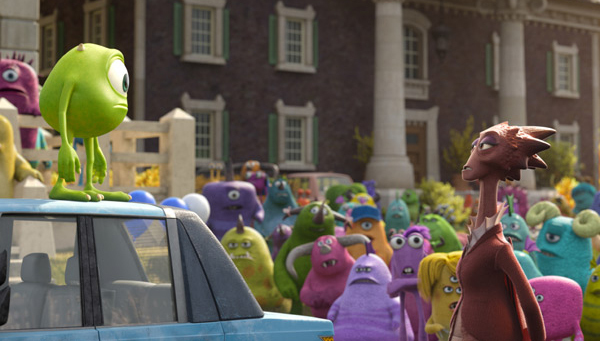 Hand-in-hand with the terrific vocals are the superlative visuals, and by some stretch Monsters University is the most technically accomplished and unexpectedly gorgeous Disney-Pixar release yet. A brilliantly judged blend of more cartoonish design and artistry mixed with at times almost photo-realism, the advances made since Monsters Inc are surprising in both their subtlety yet undeniable impact. Fur and other textures are immaculately rendered with terrific clarity and physics, and even the more extreme monster designs have a palpable look and distinguishable feel to them, with the gloss of an eye or the detail of scaling on a hide cementing a realism that on paper should be jarring and illogical yet instead lends the film a depth and texture to its visual that is both stunning and wonderfully vivid. Pushing all the particulars aside though, Monsters University is above all a genuinely great, perfectly-pitched family movie, and another Disney-Pixar classic in the making. To say it has ‘something for all ages’ seems such lazy surmising and commentary, but it is truly difficult to envisage anyone not enjoying themselves or finding plenty to appreciate here, providing they do not go in expecting a re-tread of the original. 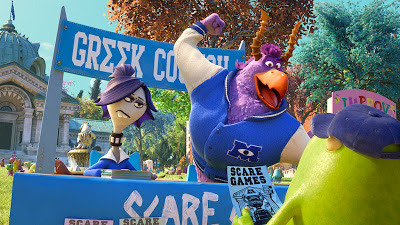 Pixar may have had a handful of uncharacteristic misfires in recent years, but Monsters University is a confident, exuberant return to form, a brilliant demonstration of the studios standing as the go-to guys for terrific sequels and quite simply some of the best fun I’ve had at the cinema in years. 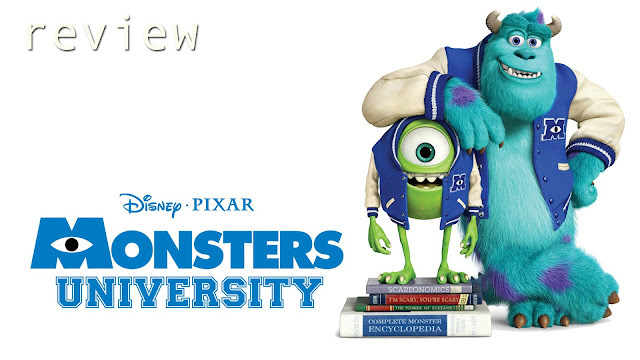 Press access for this screening of Monsters University was provided by Walt Disney Motion Picture Studios UK. (A)musings Media gratefully acknowledges their generous invitation.